The next upcoming New Years Eve is on Tuesday December 31st, 2019. New Years Eve is held on December 31 every year and celebrates the past years achievements and goals with much anticipation and optimism towards the New Year. This is one of the largest celebrations around the world as people attend parties and social gatherings where food and drinks are served especially alcoholic drinks and lots of dancing and fun. At midnight firework shows as well as individuals with their own fireworks are set off to bring in the New Year. 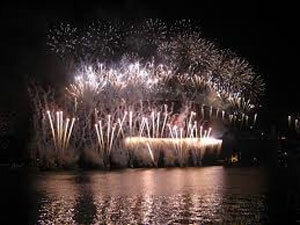 Many of the activities will run into New Year Day on January 1st of the next year. In the United States, one of the biggest events to attend is in New York City's Times Square where they drop a 12 foot diameter Waterford crystal ball located on the roof of One Times Square down a poll 70 feet high. The ball drop occurs one minute before midnight on December 31st. This event collects over a million people with the ball drop being done every New Year since 1907. New Years Eve is not a national federal holiday however some states do recognize it as a holiday with many business and organization around the nation closing for the day or half day. New Years eve marks the end of the Gregorian Calendar year with December being the last month of 12 months and the 31st being the last day of 31 days in the last month of the year. The day is sometimes referred to as Old Year's Day of Saint Sylvester's Day in some countries and celebrations to mark the end of the year and the beginning of the New Year have been going on since the Julian Calendar was in use from 46BC up to 1582AD where the now popular Gregorian calendar is used.